What are the key components of a good plan? What are the key components of any good and well thought out plan? 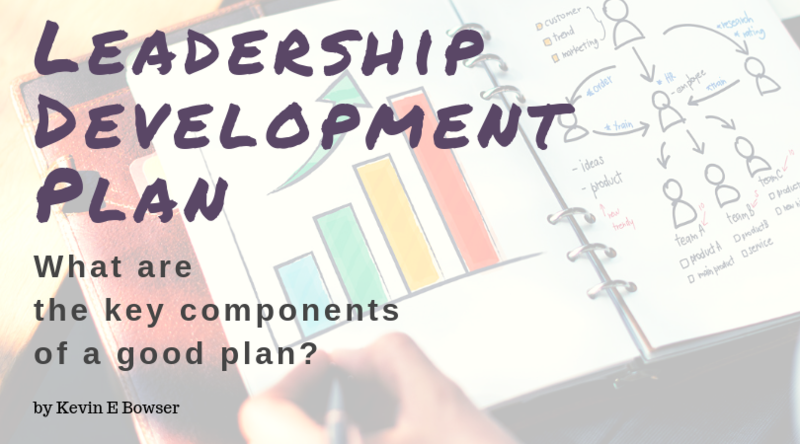 Surely there would be some components to all leadership development plans that would be universal and common regardless of the specific leader being developed. And there are. 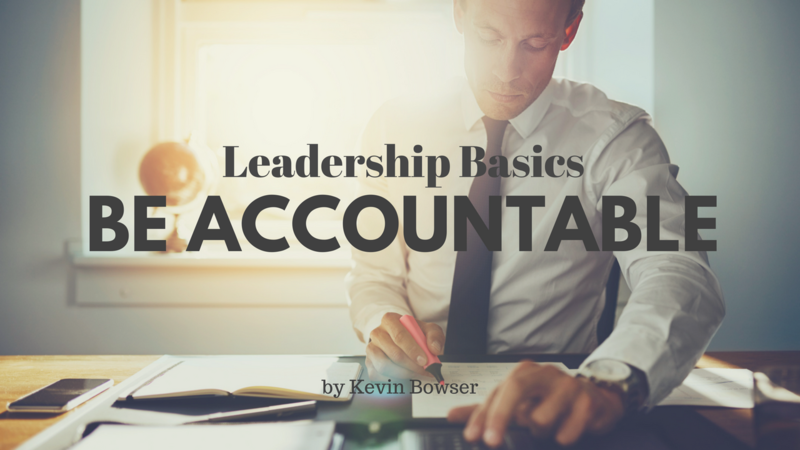 There are components that are common whether you are a CEO, a front-line supervisor, departmental manager, a military officer, or the pastor of a small church. So, let’s identify what those components would be. I am approaching this from the perspective of someone who is a coach for individuals who are seeking to become better leaders. So, all of my thoughts and words are based on the premise that I am engaged in a coach and client relationship. It may be a formal paid engagement. Or it may be an informal or ad hoc conversation where someone is coming to me for advice. However, for purposes of this article, I am going to use terms that indicate a coach and client scenario. So, what are the common components? Is there a current assessment? — Is there some assessment, either a self-assessment or a 360 assessment, that can be used as a baseline for where the leader is today? If not, why not? If we don’t have a baseline, how will be able to assess progress? What are the strengths and weaknesses? — Every leader has both strengths and weakness. Great leaders strengths more than overshadow their weaknesses. Poor leaders weaknesses overshadow their strengths. So, let’s identify what those strengths and weaknesses are. 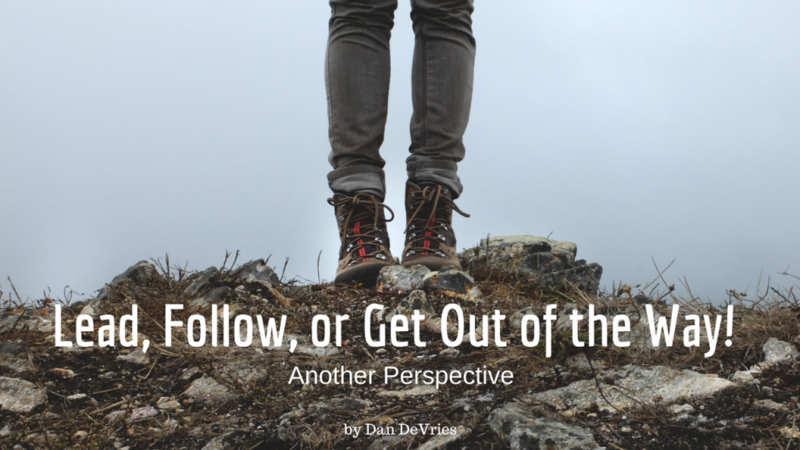 We’re all familiar with the phrase, “Lead, follow, or get out of the way”. During my adult life, I’ve found myself doing all three at one time or another. By my very nature, I tend to want to lead. Sometimes that is truly the case because I have the passion and feel I also have the experience, knowledge, or skill to move things forward in a positive direction. It may also be because I see a void of leadership that I feel an obligation to fill. Other times, truth be told, it’s probably more of a self-centered desire for the adrenaline rush that comes from being in the middle of the action. The “follow” part often does not come as easily for me. Call it a type-A personality or a distrust of others’ intentions, I can find it hard to be inspired to get behind another’s efforts. Add to that a series of uninspiring leaders in my past along with a failure on my part to seek out a successful mentor that I could utilize not only to learn but also to develop trust. I’ve also spent a significant portion of my professional career working in a zero sum environment where acknowledging another’s leadership and helping to move their agenda forward often comes back to be viewed as your own lack of vision or initiative. There have, however, been a few bright spots where I have been able to trust another’s interests and motives and take a subordinate part on a team just to be around the leader and to be part of something greater than myself. 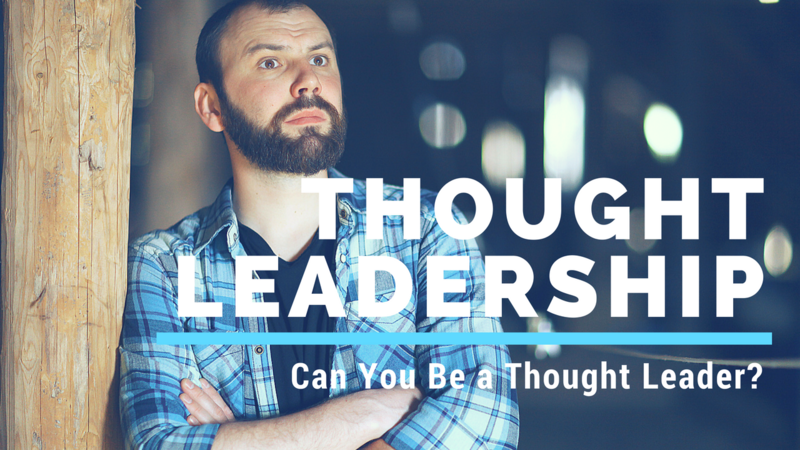 Can You Be a Thought Leader? There was not as much backlash as I had anticipated. I was expecting a much stronger reaction from the leadership community where I hang out most of the time. There are many who do not look upon this as being “real” leadership. But, there are many that do. The question itself almost indicates that being a thought leader is something that we should seek after. And if it is, can you become one? Just like some basic leadership skills that can be developed over time, basic thought leadership skills can be developed as well. Having said that, everyone can become a thought leader to some degree. Thought leadership takes time (it takes a lot of time), it takes knowledge, and it takes a recognized expertise in a particular field or endeavor. Further, it takes a certain level of confidence in your own ability, a commitment to pursue excellence, and a willingness to go against the grain or to challenge the way things have always been done. One of the challenges that exists today in many organizations is the creation and staffing of “Centers of Excellence.” More often than not these are staffed with young, talented folks who have lots of potential. They may even have advanced degrees that were tucked on immediately to their undergraduate work. Their degrees are impressive. So, let’s make them “thought leaders” and put them in a COE. 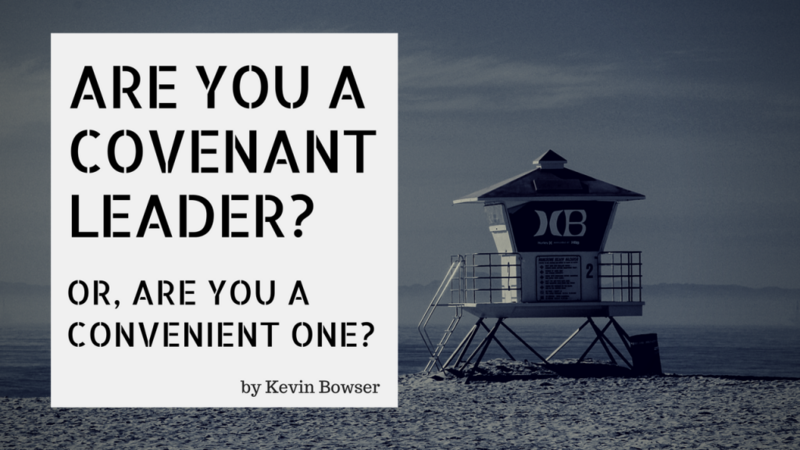 Are You A Covenant Leader? Or, are you a convenient leader? Two of my grandchildren attend a school with the word “Covenant” as part of the name of the school. They take this word seriously at the school. I was discussing leadership topics the other day with another person who is as passionate about leadership as I am and I was a little aggravated with the state of leadership among some who would be leaders. Unfortunately, the lack of covenant leadership is just too easy to identify today wherever you look. One of the descriptions for leaders that I observe today is that they have no concept of a covenant and are just being convenient leaders. So, what does that mean? What do you do when something goes bad? Where are you when there is a failure or when a major deadline or deliverable is missed? Real leaders that folks want to follow understand that the “buck” really does stop with them. Failure is inevitable. And failure does not have to be fatal to your leadership or your career. I recall working for a CIO many years ago. His mantra was; “If you aren’t failing, then you aren’t attempting big things.” Now, he wanted us to be calculating in our risks. But he wanted us to be taking risks. So often the greatest rewards come from the greatest risks. But you must still be accountable. One of my greatest failures came from managing a project to restack most of the floors in a high-rise tower. We were reorganizing to increase our efficiency and foster greater collaboration among the business units. One of the major phases of the project was creating a call center on one of the floors. All of the construction work was done and the call center furniture was in place. All that was left was for my team to re-install all of the IT and communications equipment over the weekend. We finished about 2AM on the Monday morning that the call center was to “go live.” And we all went home for a few precious hours of sleep before coming back to work later in the morning. Help me focus on one more than the other! Leaders inspire us as much as they lead us. 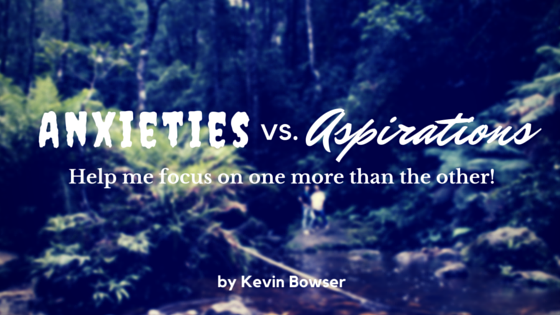 Really great leaders inspire us by helping us to focus more on our aspirations and less upon our anxieties. As I look around today and try to make some observations in the midst of an intense political season, one thing is clear. Most candidates (from both parties) are trying to tap into our anxieties much more than they are our trying to tap into our aspirations. If they are correct, and we are an angry electorate, then we are the root of their methodology and approach. They are simply giving us what we want. We are full of anxiety and that anxiety has lead to frustration, which has led to anger. And they, in turn, are tapping into that deep seeded emotion. If they are incorrect, and we are an electorate that still aspires to greatness, then they are completely misjudging the tenor and tone of the nation. They are pandering to a minority of voters and they will ultimately be rejected at the ballot box. What is the leadership lesson in the midst of this political season? The leadership lesson is this. 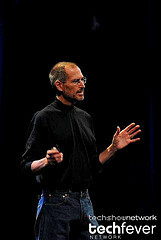 Jony Ive, is a Senior Vice President of Design at Apple. He outlined his three key tips for designers during a talk at London’s Design Museum. 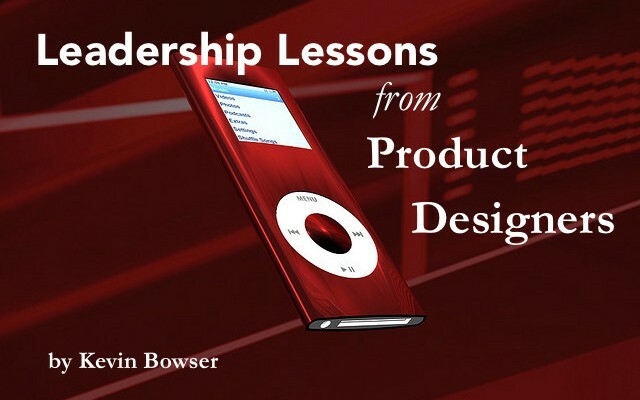 These three practices – although crafted in product design and development language – are spot on for leaders intent on bringing new life to plateaued or declining organizations. Many times product designers work in start-up or entrepreneurial ventures. Cash is not yet king and errors are costly. Too many errors in these early stages will bankrupt a fledgling company and prevent us from ever experiencing their remarkable products. 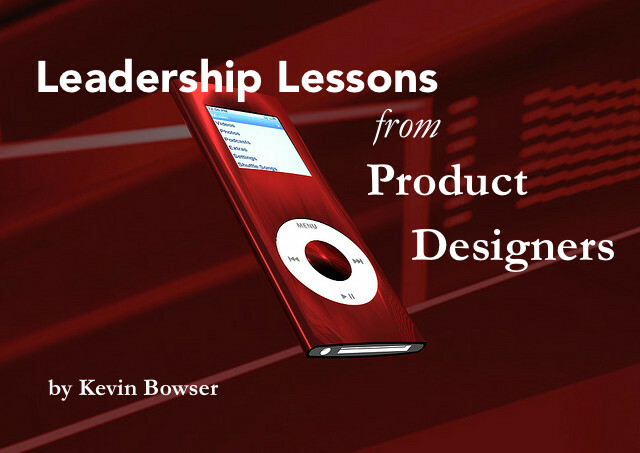 Those product designers who work in established and mature organizations often experience a cut throat world where the product designer that hits on a winning design is potentially rich beyond his wildest dreams. But the carefree days and camaraderie of the start-up are long gone. What is the Leadership Lesson in these three practices? 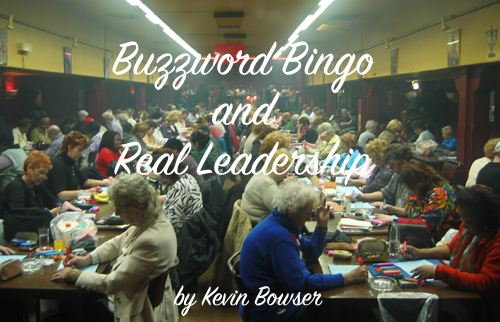 How many times have you been tempted to play “Buzzword Bingo” in a business meeting? What? You don’t know how to play Buzzword Bingo? Well, let me explain it quickly. Buzzword Bingo, also known as something a little more “earthy”, is a bingo-style game where participants prepare bingo cards with certain buzzwords that they are likely to hear at a meeting or event. They mark them off their game card when they are uttered during an event, such as a meeting or speech. 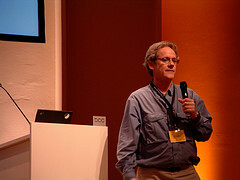 The goal of the game is to mark off a predetermined number of words in a row and then yell “Bingo!” It is generally played in situations where audience members feel that the speaker, in an effort to mask a lack of actual knowledge, is relying too heavily on buzzwords rather than providing relevant details. An important element of the game is having the courage to actually yell “Bingo!” once you have collected enough marks on your card. In order to avoid the repercussions that could result from doing that in a public setting, participants may resort to looking at one another and silently mouthing the word “Bingo”. An alternate variation requires the person who has achieved bingo to raise his or her hand and use the word “Bingo” within the context of a comment or question. Consider if you would a couple of thoughts regarding the differences between buzzwords and real leadership. Buzzwords are a poor substitute for the real content. In fact, that is the key reason that some leaders tend to rely on buzzwords so much. They really don’t have anything of real substance to offer. Real leadership, on the other hand, offers a vocabulary of meaningful dialog. A leader does not have to have the vocabulary of a Mensa member. 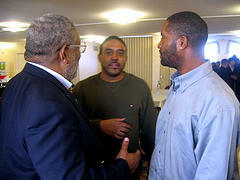 But real leaders use words of real substance and they encourage meaningful words of dialog in return. What has been in my thoughts lately due to situations in my latest career stop is the last stage..…. “Sustain”. More to the point, how leadership in my experience commonly fails at driving actions to sustain implemented changes, processes, policies etc. An interesting item I read is that the Japanese word “shitsuke” (translated to “Sustain” to maintain the 5S moniker) may actually be better translated to the word “commitment”. Does this mean I believe leadership has failed to be committed on a whole? Not necessarily, but from a narrow viewpoint, I do think one of the more difficult aspects of effective leadership is a commitment to sustaining actions after the “crisis” or “action” moments are implemented. Maybe the co nundrum with commitment to sustaining is that it is boring? Dull? Lacks glitter and glamour? It is humdrum? 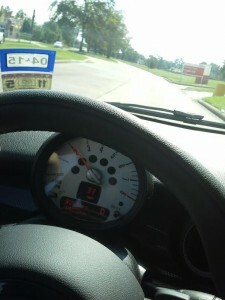 It does not bring forth the adventure of something new and of an attainable and tangible goal to concur!!! In training for 5S you won’t hear about problems with the first 3 steps very often. Why is that? Maybe because breaking something down and rebuilding it is a challenge. Transformation is something that we can visualize the change in, set easy goals that are perceptible in some way to achieve, can be easily celebrated and can make for a great graph or photo placed in a Powerpoint presentation. Sustaining is……..repetitive dedication to adhering to a standard. Where’s the excitement in that? I will have to admit it took me a few days for that to sink in, and what I have come up with is this. They are right. As our passivity grows, so does our acceptance of passivity. So as I thought about this over the weekend this is what came to me. I researched “Passive Leadership” and I found the term “passive patriot”. It spoke to me. A passive patriot is a citizen who fails to combine knowledge and action to maintain democracy. The research behind this is expansive and certainly beyond the focus of this blog. However, what I couldn’t shake from my mind is the parallel to the current state of leadership in our organizations and in our country. We have too many passive leaders failing to shift away from applying 20th century leadership practices to 21st century problems. Such problems cannot be solved relying on the familiar. Regardless of whether it be hierarchy, too much work, not enough time, or not enough resources, we need active leaders. The lull of passive leadership is convincing and believable. Yet the level of inaction at the leadership level to tackle such problems is weakening organizations. In the 21st century, knowledge, and the application of it to create value for customers, is king. Underlying this reality is the acceptance that people create the profit. Without knowledgeable, enthused people, we will suffer. Will you or your team be lulled to sleep by passive leadership and erode your value in the marketplace? Will you chase away talented employees? Will you create committed followers or customers? We need today more leaders willing to act first and then figure out what’s next and not accept failure or misunderstanding. You can be one of them. Perhaps you already are. Many of the big problems facing businesses will simply expand in complexity the longer they are ignored or accepted. You don’t need a CEO, executive, or a director to inspire you to get into action and do something to address the company’s problems. You can decide today to lead locally: lead your team to figure out what problems are limiting the value you create for your customers. And then find a solution. Getting your hand slapped is a requirement in leadership. 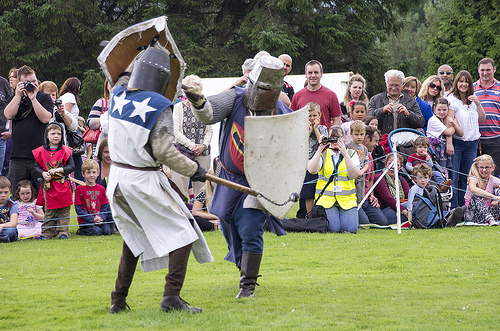 It’s a full contact sport. It’s standing for something bigger than you. Tackling 21st century leadership problems is worth getting your hand slapped over. It’s worth finding and using your voice. It begins with looking at where your passive leadership is holding you back and deciding where you can turn up the volume in your leadership. Stop accepting excuses for failure. Get in the trenches with your people and lead from the front.